Egypt's Opposition: Will the Islamists Join ElBaradei? It had all the hallmarks of an al-Qaeda attack. Shortly after midnight, an explosion detonated by what authorities say was likely a suicide bomber ripped through a crowd of worshippers as they emerged from New Year's Mass at a church in Egypt's northern port city of Alexandria. The blast left 21 people dead and 79 others wounded, while opening a fresh wound in the country's already problematic sectarian rift. For months, al-Qaeda militants in Iraq have called repeatedly for attacks on Christians  in retaliation, they say, for the alleged kidnapping and detention by Egypt's Coptic church of two Christian women who are believed to have converted to Islam. On New Year's Day, Egyptian officials painted the bombing as a brutal, foreign assault (though they have not directly accused al-Qaeda; Egypt has typically been wary of making such an explicit link to attacks for fear of scaring off tourists). 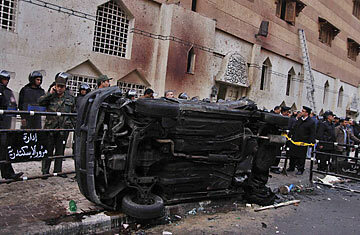 President Hosni Mubarak stressed in a televised speech that the terrorists had targeted both Christians and Muslims. And one of Egypt's highest religious authorities, the office of the Grand Mufti, issued a statement declaring that "Islam and Muslims are innocent ... Such an act could not come from a Muslim who knows the truth of Islam." More likely, the Mufti concluded, was "the involvement of foreign parties that want to strike at national unity." So far, however, there's little evidence for that. Skeptical analysts say the claims are all typical rhetoric for a regime whose officials have used foreign intervention as a scapegoat for violent incidents ranging from terrorist bombings and rocket attacks to maulings by sharks. While many analysts believe the attack was at least inspired by outsiders, the government's real fear, they say, is that it was homegrown in its design. For the authorities, who waged a crushing campaign against violent Islamist extremism in the 1990s and who last week had Egyptian churches on high alert, that would be a huge admission of failure. But more troubling still, it would shine a spotlight on a troubling reality that the state has been at pains to sweep under the rug: Egypt's worsening sectarian tensions. "The official rhetoric is always that problems don't exist," says Hisham Kassem, an independent newspaper publisher and social critic. "There are issues of discrimination against Copts, and they're refusing to deal with them." Christians make up about 10% of Egypt's 80 million people. But observers from both Coptic and Muslim communities say sectarianism has been on the rise for years as a result of deepening religiosity and competition for resources amid worsening economic conditions. Copts have long complained of government discrimination and neglect, while Muslims have accused the Coptic community, which is subject to slightly different rules and regulations, of receiving preferential treatment and living outside the law. Christians are required to seek state approval to build churches, and intermarriage between Coptic men and Muslim women is illegal. In November, violent clashes broke out in Cairo over plans to build a church. And almost exactly one year ago, a gunman massacred seven people in a town in southern Egypt following a Christmas Mass. But conversion is one topic that has been particularly contentious and increasingly public as well. Since last summer, Alexandria  known half a century ago for being Egypt's breezy, cosmopolitan gateway to the Mediterranean  has become the epicenter of extremist outrage over the alleged captive converts. While al-Qaeda militants in Iraq have called repeatedly for attacks on Christians until they are released, adherents to the hard-line Salafi sect of Islam have staged regular protests in which they compare the Egyptian Pope to the devil and liken their conflict to the Crusades. It's no wonder then that not everyone is buying the official line on the source of the attacks. "I remain more convinced that it is an Islamic jihadist group rooted in Egypt and Alexandria, and it stands behind whatever has happened," says Yousef Sidham, the editor of Al-Watany, a Coptic Christian newspaper. "We know that whenever al-Qaeda succeeds in an attack, they always declare responsibility for it," he adds. In this case, that hasn't happened yet. Meanwhile, the national unity that state authorities have called for today may instead wind up another casualty of the midnight bombing. Shortly after the explosion, clashes erupted between Christian and Muslim protesters who gathered at the scene, and the Associated Press reported that a mob of Christians broke into a nearby mosque, throwing books into the street. On Saturday, Jan. 1, clashes continued between Christian protesters and police wielding tear gas. It's a cycle that analysts say is likely to repeat in the days ahead. "It's a very hot situation, and it is liable to be continuous," says Milad Hanna, a Coptic politician and former Member of Parliament.